Huawei GR 3 Dual SIM phone runs on an Android 7 Nougat operating system. Buy this Dual SIM Huawei smartphone at Souq.com.Huawei GR3 Dual SIM 2017 keeps up with your fast paced lifestyle and delivers incredible performance on all fronts. Flaunting a white color, it looks great and feels great too. The 12MP rear camera and the 8MP front camera of the device let you capture all the fleeting moments of your life in a jiffy. Thanks to the 5.2inch Full HD display that delivers high definition visuals, you can enjoy HD videos and games the way they're meant to be. This Huawei smartphone has a 4.0 fingerprint sensor that ensures comfort and safety at your fingerprints. With Huawei smartphone’s 4G LTE cat4 networking, you will never have to slow your pace. With a download speed up to 150Mbps, you can enjoy the smooth interaction with your world. The 3000mAh battery keeps you unplugged for long hours and makes this phone your ideal companion when traveling long distances. This Huawei phone runs on Android 7 Nougat operating system that gives you seamless updates and excellent user interface. 3GB RAM in the Dual SIM Huawei smartphone runs all your applications at a lightening fast speed. 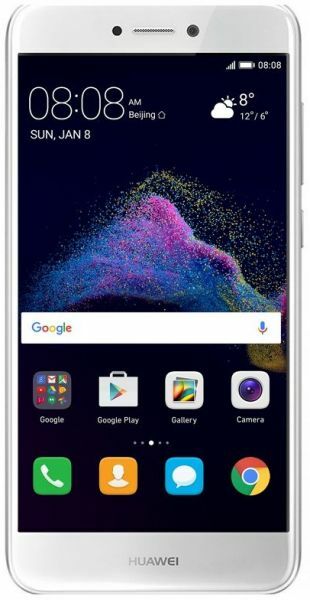 This Huawei mobile is powered by a Kirin 655 Octa Core processor with FinFET plus process technology that delivers extremely efficient multitasking experience. This Huawei Dual SIM GR3 2017 smartphone delivers consistent performance for everyday use. This Huawei GR 3 is powered by a Kirin 655 Quad Core processor with 16nm SoC that ensures both high performance and lower battery consumption. The 3GB RAM gives a seamless multitasking experience even after continuous use of the phone. The 3000mAh battery is for the ones who prefer like to stay unplugged all day long. With Android 7 Nougat OS, you can switch between apps with a double tap, and run two apps side by side. Fingerprint sensor 4.0, with its next generation biometric reading technology, unlocks the phone in less than 0.3 seconds and access the home screen as soon as you want to. Enjoy life in high definition with a 5.2inch display of this Huawei GR3 2017 smartphone. It gives you awe inspiring visual experience with its 2.5D glass. Let your spirit fly away with music by the crystal clear sound of this GSM Huawei phone. Super Wideband audio system provides three dimensional audio output that increases stereo quality and raises the pitch of the voice so you can listen better. This GR3 2017 Huawei Dual SIM phone features a 12MP, BSI primary camera with autofocus and fast lens technology, which allows you to shoot your memorable moments in HD detail. The 1.25micrometer, large light sensor delivers excellent image capturing performance while the PDAF fast autofocus gives your pictures a professional touch. And with an 8MP front camera, you are ensured to get beautiful selfies with fascinating and ultra fine detail.